I’m no handyman, but I can guess how that project will end. With water gushing out the exposed space, adding a bunch of tape might at best reduce the size of the puddle on the ground. It’s a patchwork solution. It’s not going to get to- and fix- the root of the problem! But that’s effectively what’s happening when you supplement with your average calcium supplement. The calcium source inside is like a masking tape for your bones. Unfortunately, that’s the case with a vast majority of the calcium bottles you see on retail shelves right now. That’s why you need plant-based calcium. Because- believe it or not- your bone health is dependent on what’s happening in the ground. So let’s discuss plants for a moment. As you may know, your body must absorb the vitamins and minerals it gets after digesting the food you eat. And as you also may know, our bodies can’t absorb raw metals from the soil. By that I mean, you can’t absorb the calcium, magnesium, and phosphorus from the ground without a bit of “processing” first. That’s where plants come in. Plants actually “predigest” the minerals in the soil and rocks. This makes the minerals in the plant completely absorbable to you now! These minerals are available in the right amounts after the plant’s hard work. Just the way nature intended. If you were to analyze the trace minerals in a given plant, you’d find more than just calcium inside. You wouldn’t just see nitrogen. Just as you wouldn’t merely see boron. There are no “isolated” nutrients. No test tubes or lab coats selectively extracting ingredients and modifying a final product. Just a natural, untouched mix of minerals from the ground. And it’s this symphony of minerals your bones are used to and need to remain strong. So why are millions feeding their bones 1 or 2 or 3 ingredients, in hopes their low bone density will improve? The spinach, the tomatoes, and potatoes you eat have more than just calcium or vitamin D or magnesium in them. Yet traditional calcium supplements (which may or may not even include vitamin D and magnesium) are expected to curb bone loss. The problem is, these calcium supplements are made from “rock-based” calcium. Not plant-based calcium. 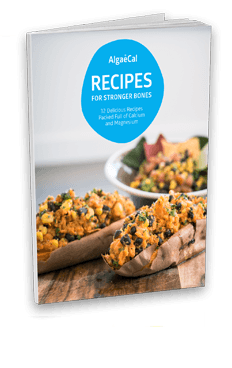 I’m going to share the best plant-based calcium you can feed your bones in just a moment. 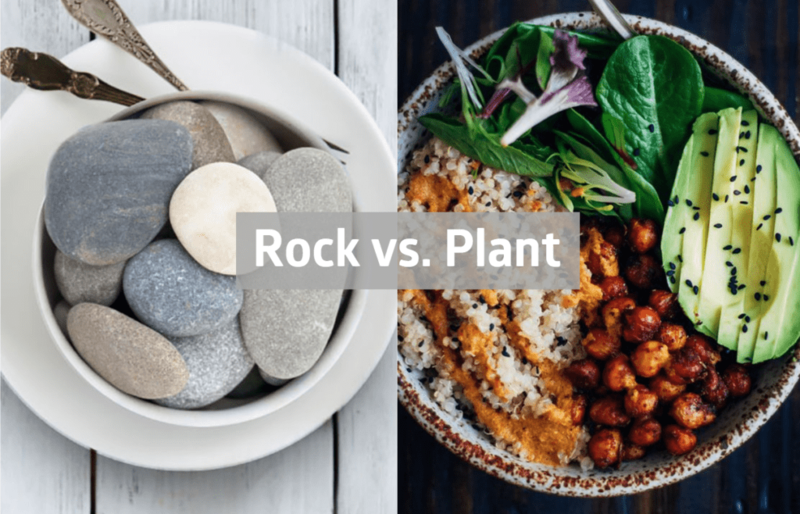 But before I do, let’s discuss the crucial difference between plant-based and rock-based calciums. Rock-Based Calcium – Traditional calcium supplements are actually made from rocks. Yes, ground up rocks. Straight from dusty calcium mines. Some are made from marble. Some are made from limestone. Both are completely inedible and poorly absorbed. Unfortunately, over 90% of the calcium supplements available today are rock-based. Check the label on your calcium: if you see calcium carbonate or calcium citrate on the back, you’ve got rocks. And I don’t need to tell you our bodies weren’t meant to digest rocks! Some marketers will add a vitamin D or magnesium to the mix to really “power up” their supplement. But as you’ll see in a bit, your bones need no less than 13 crucial trace minerals to stay healthy. Now, to deflect the scrutiny away from the inorganic source of calcium, marketers look to another (granted, important) feature: absorption. For example, they’ll claim calcium citrate is better absorbed than others, because the rock calcium is treated with citric acid. But science shows otherwise. You’ve been led to believe that absorption rates equals efficacy. That makes logical sense– whatever’s better absorbed will have a greater effect in the body. But studies show: the best-absorbed calciums do not have the best effect on your bone density. The facts are – all calciums absorb between 25-35%. So in the end, you’re still eating the inedible. Even if it was a highly-absorbed calcium source, what good will that do if it’s devoid of the nourishing trace minerals your bones crave? Nowhere in nature do you find food that contains just 1 or 2 nutrients. But that’s what rock-based calcium offers you every day. You can probably see now why these supplements can constipate, bloat and cause other digestive discomfort. Now to be fair, rock-based calcium is better than no calcium at all. From age 40 onward we lose 1% of our bone each year on average (and quite a bit more over the 5 years after menopause). In other words, if we live long enough, just about everyone will become osteoporotic and risk having a fracture. But rock-based calcium is proven to delay that fate, at least a little. Studies show that rock calcium slows annual bone loss. So instead of losing 1% per year, we may lose ¾ %. Plant-Based Calcium: As the name suggests, this is calcium derived from a plant. It can be a plant on land or sea. Unlike the rock-based, this calcium is untouched and contains the bounty of minerals naturally found in the ground it grows. The earth minerals are converted into body-friendly molecules. This means every part of your body gets the most from these previously non-absorbable minerals– including your bones. And that’s the most important difference between these two calcium sources. Now, where can you get plant sources of calcium? You may be pleased to know it’s not all that hard to find plant sources of calcium— either in your home or the grocery store. What’s more, you can get them in both liquids and solids! To see a more comprehensive list of plant-based calcium sources, and their varying amounts, check out this post on vegan calcium sources. Now you’re probably thinking it’s difficult to get enough calcium from plants. And you’re right. It takes 11 cups of broccoli to reach your RDA of calcium. You now know the difference between rock- and plant-based calcium sources. So it will be easy to see why what I’m about to tell you might be the most exciting news you ever get if you have low bone density. It all begins with, like we mentioned, what’s happening in the ground. Specifically, the ocean floor. What am I talking about? Well, at AlgaeCal we found the most mineral-dense organic plant on the planet. It’s found off the shores of South America. It’s actually a marine algae the natives have guarded for generations– most popularly used to raise prize livestock. And while that in itself is impressive, it’s what’s inside (and how much) that’s really special. This rare ocean algae – Lithothamnion superpositum (or Algas Calcareas as the locals call it) – nearly mimics your bones’ mineral composition. We call it AlgaeCal. AlgaeCal naturally has all 13 mandatory bone-building minerals inside. And 60 more for good measure… right from the ocean. Plus, it holds these nutrients in roughly the same proportions as found in your bones right now. Oh, and did we mention AlgaeCal is the planet’s only certified organic calcium source? Seeing as it’s a plant source of calcium, the algae already has these minerals predigested. But there’s an important difference: this ocean algae is a much richer source of trace minerals than plants that grow on land. That’s why you won’t have any upset stomach or constipation from AlgaeCal. And that’s also why we can guarantee stronger bones after taking it. It took us a while to figure this all out, but once I realized the truth about this algae, my business partner and I put our life savings into funding human studies. We needed to find out if the algae actually performed better than traditional rock calcium. The theory was great, but what happens in real human studies can sometimes be disappointing. Today, 6 groups of people in 3 properly conducted independent studies have all INCREASED bone density. That is an unheard of result. It was so out of the ordinary that the medical journals resisted publishing the results the first time. After they double checked all the data and interviewed the study investigators, it became clear that the results were real. Since then, other journals have peer-reviewed and published follow-up studies and the evidence is now irrefutable: AlgaeCal increases bone density and strength, even in older participants. And it increases bone density for the long-run… not just on your next DEXA bone scan. That’s because in February 2016 the Journal of the American College of Nutrition found AlgaeCal Plus and Strontium Boost together increased 172 participants’ bone density every year for 7 straight years. All participants improved bone density on average 1% each year. And not a single side effect was reported. This landmark study proved the bone-building power of AlgaeCal’s Bone Builder Pack: AlgaeCal Plus and Strontium Boost. This means when you take your own Bone Builder Pack, not only will you have stronger bones each year, you’ll have the confidence to live your life as you want. You’ll know your bone density is constantly improving so you needn’t limit your daily activities. It’s like restoring your bones to more youthful levels, today! Can you imagine how relieving that would feel for you? That life can be yours with the only clinically proven plant-based calcium supplement. You now have a new choice when it comes to calcium supplementation. Not many years ago your only choice was to slow annual bone loss with a traditional calcium supplement. Now, increasing bone density is achieved with algae-based calcium. It makes sense that plant calcium outperforms rock calcium, doesn’t it? It’s a multi-mineral versus calcium alone. It’s a solution versus a compromise. And it’s increasing bone density versus slowing bone loss! AlgaeCal is the world’s only pure plant source of calcium. That’s why we can make the promises we do. Think back to our opening story of the leaky pipe. You can cover it up with masking tape, rather than properly tightening it with a wrench. One makes the problem more manageable, the other solves it. Don’t just lose your bones slower– build your bones with a solution. Thank you for reaching out and sharing your concern, Andrea! Like we covered in this post, the majority of calcium supplements are derived from rocks. As you can imagine this is not body-friendly – it’s no wonder they can cause side effects like artery calcification and increased risk of heart attack. The safety of AlgaeCal is demonstrated in all 3 of our human clinical studies. Our most recent study lasted 7 years, in this time frame there were NO side effects, and the participants experienced a linear increase in bone density – year after year! You can see our studies here. If you have any further questions or concerns, please give us a call at 1-800-820-0184! I have bone spurs in the big toe joint of my foot. Will AlgaeCal increase the spurring? Oh no, sorry to hear that Barbara. The vitamins and minerals found in AlgaeCal Plus should actually be beneficial for your bone spurs! You can learn more about why that is here (plus see other natural bone spur treatments). 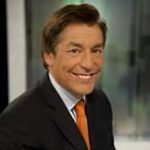 I have been diagnosed with several autoimmune issues, including MS, and have been prescribed vitamin D. I understand that vitamin D and calcium absorption are related. Does this supplement contain Vitamin D? If I take it, will I need to continue my current RX? You’re right, vitamin D is crucial for calcium absorption so it’s important you get enough! AlgaeCal contains 1,600 IU of vitamin D3. However, the majority of people are deficient, and you may need more than this! If your doctors’ recommendation is higher than 1,600 IU, then you can make up the difference through further supplementation. I AM LOOKING FORWARD TO PURCHASE A PLANT BASED CALCIUM. HOWEVER I AM CURRENTLY AS WELL TAKING A MULTI VITAMIN & MINERAL. SO SHOULD I STOP MULTIVITAMIN AND TAKE ONLY ALGAECAL? Wonderful to hear you’re making the switch to plant-based calcium! AlgaeCal would provide your bones with the vitamins and minerals they need to be replenished, so it’s not necessary to take a multivitamin or mineral supplement. If you do choose to continue with these supplements, it’s important to take them at least 2 hours away from AlgaeCal! For information on how to take AlgaeCal go here. What part of South America the algae comes from? AlgaeCal is sourced from Brazil! You can learn about our harvesting process here. Where is Strontium obtained from? Why is it important to take with AlgaeCal? What are any negative side effects of Strontium? Great questions! We use pure clinical grade strontium citrate. The mineral strontium is sourced from soil, and the citric acid (citrate) is sourced from citrus fruits. The mineral strontium and citric acid are bound to make strontium citrate! 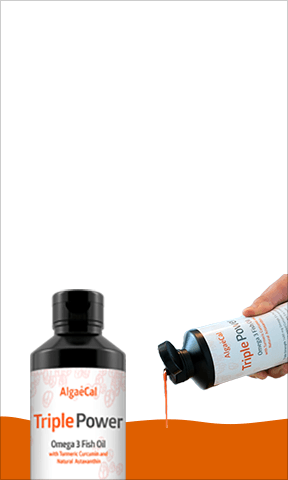 AlgaeCal Plus on its own is clinically proven to increase bone density by an average of 1.3% per year. However, we naturally lose around 1% of our bone density per year after the age of 40, sometimes more depending on other factors like hormonal changes, prescription medications, genetics, lifestyle, etc. 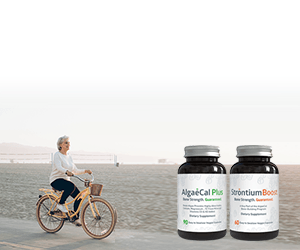 AlgaeCal Plus is not always able to overcome this accelerated bone loss, which is why we recommend Strontium Boost for anyone with osteoporosis or osteopenia – because it triples the rate of bone growth! 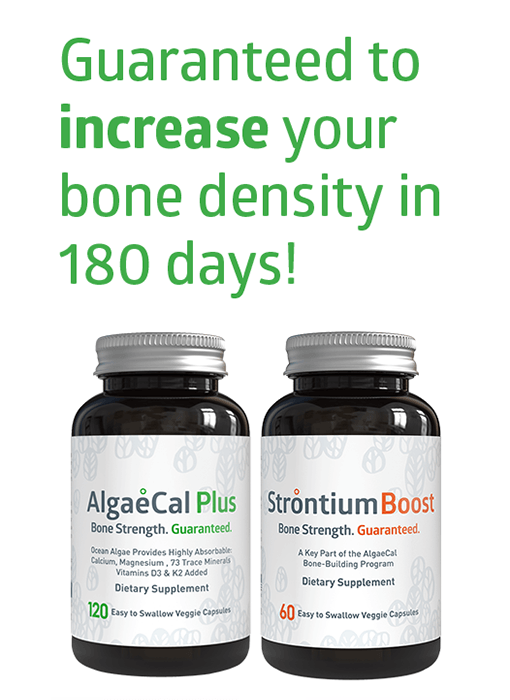 Along with being clinically proven to increase bone density, AlgaeCal Plus & Strontium Boost have no side effects! The results of a recently completed 7 year study shows extraordinary safety via a panel of 45 blood chemistries you can see here. To learn more about how strontium works and its safety, check out our in-depth blog post here. 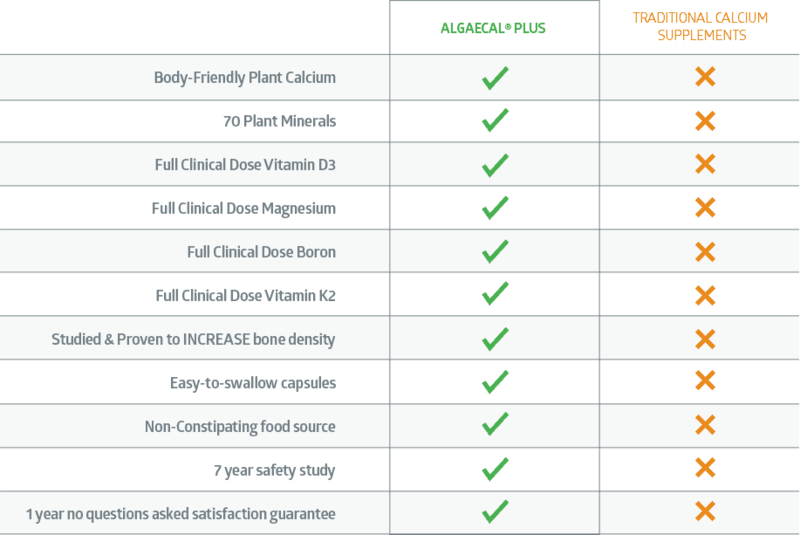 Along with being completely natural & clinically proven to increase bone density, AlgaeCal has no side effects! The safety of AlgaeCal is confirmed in our 3 human clinical studies. The latest, a 7-year long trial also showing consistent and linear increases in bone density year after year! To see those studies click here. Should plant calcium be avoided with certain types of food or doesn’t it matter? You don’t need to separate a plant calcium such as AlgaeCal Plus from any foods. 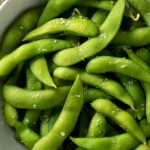 If possible, we do recommend taking it with a snack or meal that includes protein and healthy fats for optimal absorption! For more information on how to take AlgaeCal go here. I’m a new nurse practitioner and would like to recommend these type of calcium to my patients… I haven’t tried it myself since being a student is tough…. 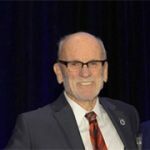 Great to hear you’re interested in suggesting plant-based calcium to your patients! Sample sizes are not available, but we do have a one-year product satisfaction guarantee which gives you a chance to try the products and see if they are a good fit for you! If there’s any reason you are dissatisfied, you can return any unused or partially used bottles for a full refund. You can learn more about this here. If you have any questions give us a call at 1-800-820-0184! 3) Do you have these minerals in powdered form in a bottle or would i have to open the capsules and add to liquid? I do not like capsules. Good question, Genevieve. AlgaeCal comes in soft veggie capsules that can be easily pulled apart and sprinkled into foods like smoothies, yogurt, and oatmeal. We just don’t recommend hot foods or drinks to avoid denaturing the vitamins. Hope that helps! 1) Will your product help my father (82) who has had a hip replacement and complains of pain in his bones? Doctors give only medications not vitamins or minerals. 2) For myself (53)…how long will the bones take to absorb the minerals? We’re glad you reached out. AlgaeCal has been specifically studied for bone mineral density increase, and not pain. 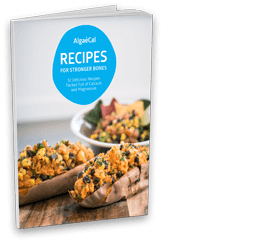 However, many customers have let us know AlgaeCal was beneficial for reducing their pain – especially if the root cause was a mineral imbalance or low bone density. 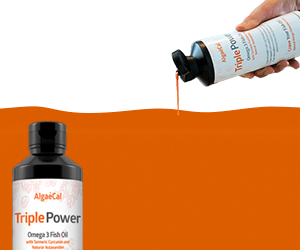 We would suggest checking out our Triple Power Fish Oil as well, it is a natural anti-inflammatory that has been extremely effective for reducing pain! It’s temporarily sold out but you can learn more about it here. 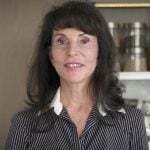 Genevieve, if you are looking to increase your bone density with AlgaeCal, you can begin to see measurable results in as little as 6 months time! This is based on our 3 human clinical studies which you can learn more about here. I have a question: Is your algae source calcified algae when producing the product? Great question! AlgaeCal does not come from calcified algae. It is a living algae (typically a kiwi-sized, purplish ball) that washes up onto the shores of South America, where it is then sustainably hand-harvested, dried in the sun and milled into a powder. I am looking forward to trying both products. I have enjoyed reading all of the information. Wonderful to hear! If you have any questions during your bone health journey, please let us know. 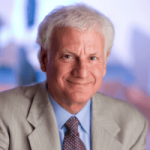 EDUCATION……..EDUCATION……and more education. WHEW!…….did ‘not’ know about “rock” calcium, until now with AlgaeCal. 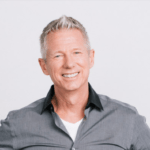 Keep the education coming Dean…….my journey right now is only 17 days into the program, but have high expectations for improved bone density……Leta C.
Thanks for the positive feedback! We are truly excited about your journey with AlgaeCal, however recent it may be. We are always here to help so if you have any questions, please don’t hesitate. Is your calcium supplement causing constipation? Discover the 9 causes of constipation and what to do about it in our latest post.